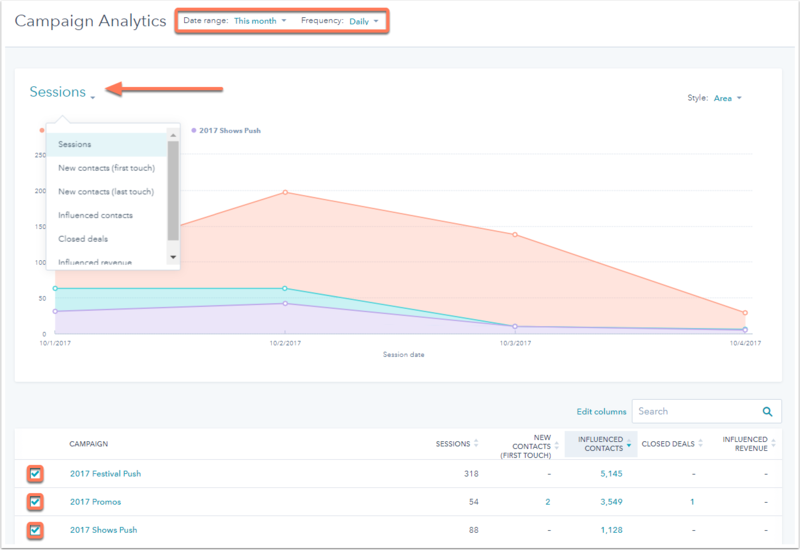 You can use the campaign analytics tool to measure the effectiveness of the marketing campaigns you've created in HubSpot. The tool analyzes five metrics to quantify how your marketing content contributes directly to closed deals and revenue. Learn about the data pulled to provide you these metrics. Please note: only campaigns created September 1, 2017 or later will be available for reporting in campaign analytics. The campaign must have data that occurred after it was created in order for it to be available in your campaign analytics tool. Use the dropdown menu in the upper left to select the report metric, and the Date range and Frequency filters to specify a time period and frequency for the report. In the table, select or clear the checkbox next to a campaign to include or exclude it from the report. Click a column header to sort your campaign data by a specific metric. To focus on specific metrics, click Edit columns to select the metrics to display in the report. Click the Style dropdown menu to select the data visualization: Area or Column. Sessions: measures traffic to assets related to the campaign. Sessions will be attributed to a campaign if the first page visited URL includes corresponding utm_campaign parameters or if the page/post viewed is associated with the campaign. In the case of organic search, sessions will be attributed to a campaign if the referral keyword is associated with the campaign. New Contacts: measures the number of newly created contacts, attributed to the campaign that brought them to your site for the first time. Contacts will be attributed to a campaign if the first page visited URL includes corresponding utm_campaign parameters or if the page/post viewed is associated with the campaign. In the case of organic search, contacts will be attributed to a campaign if the referral keyword for their first view is associated with the campaign. New Contacts (last touch): measures the number of newly created contacts, attributed to the campaign that most directly contributed to their conversion. Contacts will be attributed to a campaign if the conversion source URL contains corresponding utm_campaign parameters or, in the case of organic search, if the referring keyword is associated with the campaign. You will also see contacts reflected here if the first activity in the converting session or the most recent activity prior to conversion is tagged with a campaign (visit or form submission on associated content). Influenced Contacts: measures the number of contacts (new and existing) that have engaged with assets related to the campaigns. Contacts will be attributed to a campaign if any visited URL includes corresponding utm_campaign parameters or if any viewed content is associated with the campaign. In the case of organic search, contacts will be attributed to a campaign if the referral keyword for their first view is associated with the campaign. You will also see contacts reflected here if they have clicked an associated CTA; interacted with an associated social message; been enrolled in an associated workflow; or engaged with an associated email (opens and clicks). Please note: when filtering a timeframe for influenced contacts, the number of influenced contacts reported is the net new contacts that were influenced in that time frame, and is not a cumulative sum of influenced contacts. For example, when filtering a week, contacts influenced prior to that week will not be included in the reported number, even if they were also influenced during that week. Influenced Deals: measures the count of closed won deals that are related to contacts that have been influenced by the campaign (see above). The deal must be closed after the contact is influenced by the campaign for it to be counted. The deal also needs to be associated with the contact at the time that it is closed to be counted. Please note: a deal is determined to be closed based on two different deal properties: Close date, or Deal stage being set to Closed Won. The Close date property has priority - if there is a Close date value, it will be used to determine if the deal was influenced by a campaign. If there is no Close date value, it will default to the time the Deal stage was set to Closed Won instead. Influenced Revenue: measures the amount of closed revenue (“Closed Amount” of “Closed Won” deals) for deals that are related to contacts that have been influenced by the campaign (see above). For more information on campaign analytics and the campaigns tool, refer to the Campaign analytics FAQ.